The average temperature of the province is 37’C and the average rainfall is 500mm per annum. 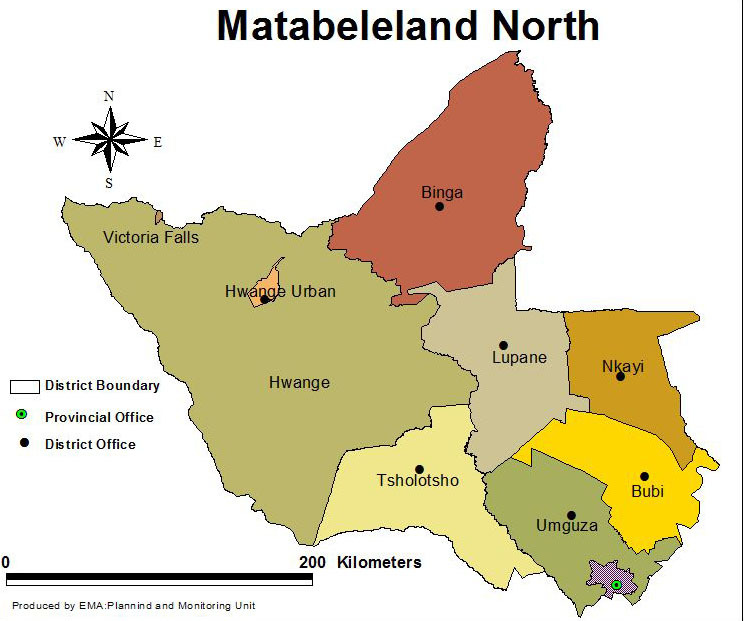 Matebeleland North greatly experiences dry weather conditions. There are high occurrence of extreme droughts and low flooding risk in the province. The most famous geographical feature in the province is the mighty Victoria Falls which is one of the seven natural wonders of the world, an international tourist resort and a celebrated historical area. The province also houses the biggest wildlife conservancy in the country and one of the biggest in Southern Africa which is Hwange National Park. The province is characterised by arid land. Most of the soils are not suitable for crop production. Sandy loam soils and less fertile kgaladi sands which are permeable and less fertile are found througout the province. Desert sands are found in Lupane, parts of Nkayi, Tsholotsho and also Bubi. There patches of red soils in some areas. However, fertile black soils and valley soils along drainage lines of Bubi, Gwai and Mbembesi are found due to alluvial deposits. The province has significant amount of gold, limestone, coal, timber, methane gas, silver, chrome, mica and also nickel mineral deposits. Indigenous hard wood timber forests are dominant in the province. There are also Savanna, woodland savannah, mahogany, mukwa and the Zambezi leak (baikiaea plurijuga). The kgalagadi sands favour the regeneration of these species. Matebeleland North rivers are ephemeral, they only flow during the rainy season. The total number of dams in the province is 611. The province is highly plagued by water scarcity and it is traditionally dry. There are natural springs, vleis and pans such as Sefula Pan which are perennial though subjected to extensive degradation.